Avocados just keep getting better. This fruit can be used in appetizers, dinners, salads, and soups. I wasn’t sure I could believe it until I tried it, but avocados can even be used in desserts. This pudding is simple to make, tastes richer than it is, and is technically a dessert made almost entirely of fruit. Can you go wrong? I don’t think so! There shouldn’t be anything stopping you from making this recipe, as it really only has a few ingredients. My roommate even raved about the pudding (if you needed another reason to be convinced to try it). So get your kitchen gadgets ready and rush to the kitchen in three-two-one. Go! You won’t regret it, unless you are one of those people who isn’t really fond of desserts (though I haven’t met many people that don’t enjoy dessert). Add the raspberries, water, and agave nectar to a pot set over medium low heat. Heat the raspberries until they easily break apart. Mash them until they become smooth, as they would if you’d pureed them. Set the raspberry spread aside and allow it to cool. While you’re waiting for the raspberries to cool, add the rest of the ingredients to a food processor or high speed blender. Set it to high and let the ingredients combine. After a minute or so, scrape the sides of the food processor and then put the lid on and put it back on high. Do this until the mixture is smooth and creamy. 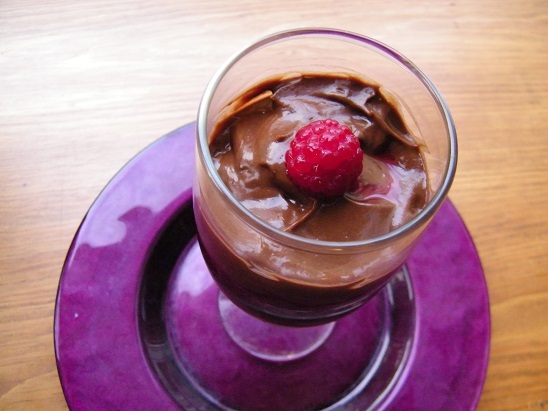 Chill both the raspberry puree and the avocado pudding before serving. 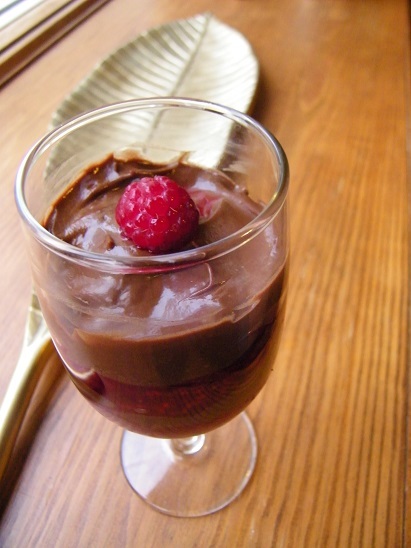 To serve, layer the avocado pudding and the raspberry puree in the serving dish or glass of your choice (I found it easiest to scoop the mixture into a glass using a small spoon). Top with a fresh raspberry and enjoy! I made your tasty recipe & loved it so much! yummmmm!